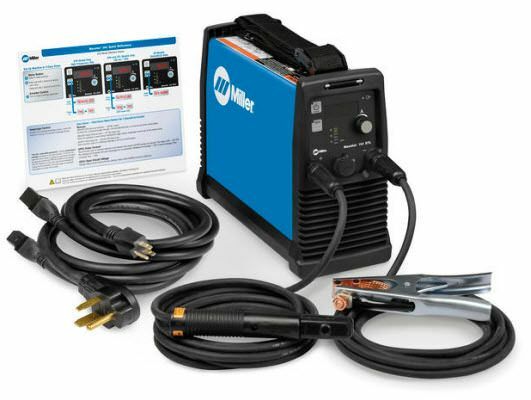 Miller Maxstar® 161 STL is a DC TIG/Stick welder that is capable of up to 160 amps of welding output. It weighs only 13 pounds and operates on either 120 volt or 240 input power. The Maxstar 161 STL features Miller's Lift-Arc™, which initiates the TIG welding arc without using high frequency. The TIG arc is struck when the tungsten electrode is lifted off of the weld piece. Genuine Weldcraft™ WP-17 150 Amp Air-Cooled TIG comes complete with a male, 25mm gas-through Dinse connection and 25 foot leads. Miller® RCCS-6M remote amperage fingertip control with 6-pin plug. Miller Maxstar 161 STL TIG Welder 907710 is made in Appleton Wisconsin. Miller Miller Maxstar 161 STL TIG Welder - 907710 does not come with a hard case. The part number for this package with the hard case is 907710001 and is currently on our site for $1549. Quality product from a quality reseller. Fast shipping too. When it comes to welding Miller cannot be beat. You may pay less for others, but you'll get less too. If you desire the best quality Miller is the only choice. Easily welds everything I need on 110 v. High frequency start would be nice but for the price difference I've gotten used to the lift start. Portability is about as good as it gets. very smooth arc smooth start ups with lift arc. Easy ordering fast delivery, it was shipped without ground and stinger, I called Cyberweld and they got one right out to me within 2 days .